Pingalwara literally means a home for the crippled. However, this institution caters to the needs of the handicapped, the insane and the terminally sick. It is primarily a rescue-home for the poor, helpless and maimed. The promoter of the Pingalwara is Bhagat Puran Singh, a selfless and dedicated Sikh. He was born in Lahore and used to do voluntary service at Gurdwara Dera Sahib. He would clear the streets of Lahore and cremate the unclaimed dead. He took care of the destitute and took the sick to the hospital for treatment. After the partition of India in 1947, Bhagat Puran Singh set up a centre at Amritsar. First, he had a few tents to accommodate the poor and the sick. Soon he got a plot of land and constructed a three story building to house 250 patients. The unclaimed bodies of those who die in Pingalwara are taken to the local medical college for teaching anatomy. Pingalwara receives grants from the government, Shiromani Gurdwara Parbandhak Committe, Amritsar and similar charitable institutions. 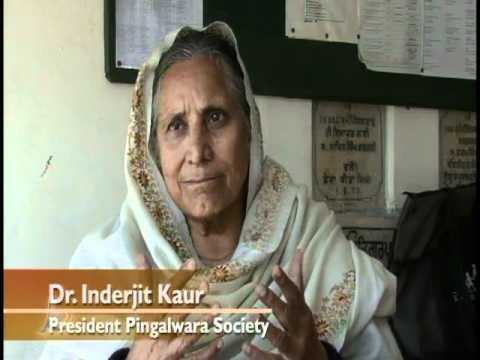 Sikhs, both in India and abroad, collect funds and send them to the Pingalwara. Bhagat Puran Singh is an institution in himself. He is an unassuming and dedicated Sikh, who reminds one of Bhai Ghanhiya, a Sikh of the Tenth Guru. Puran Singh is a true Sikh in the old tradition and has won public esteem for his humanitarian work all over India. He is called by various epithets – “Mother Tereasa of Panjab”, “the bearded saint of Amritsar”, “Bhai Ghanhiya of the twentieth century”. Bhagat Ji was also writer as well as publisher and an environmentalist. Bhagat Ji’s contribution in spreading awareness about the global dangers of environmental pollution, increasing soil erosion, etc are now well recognised. For his dedication and unreserved service to humanity was awarded with heaps of honours from many quarters. Prestigious among these was the Padamshri award in 1979, which he surrendered in the wake of the army attack on the Golden Temple in 1984. Bhagat Puran Singh Ji left for his heavenly abode on August 5, 1992 aged 88 years. « Give an account of the Sikh-residents abroad?